Whenever a console is launched there is always a large rush of titles released to try and ride the hype train. However ever since the PlayStation Vita was released, the handheld has been lacking a certain genre outside of one remade game released shortly after the console hit North America. 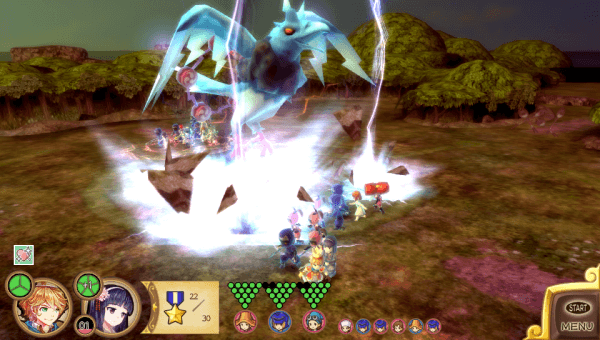 However another game with RPG elements has come to the PlayStation Vita and it may sound a bit familiar to some of you as it is one that once appeared on the Wii. 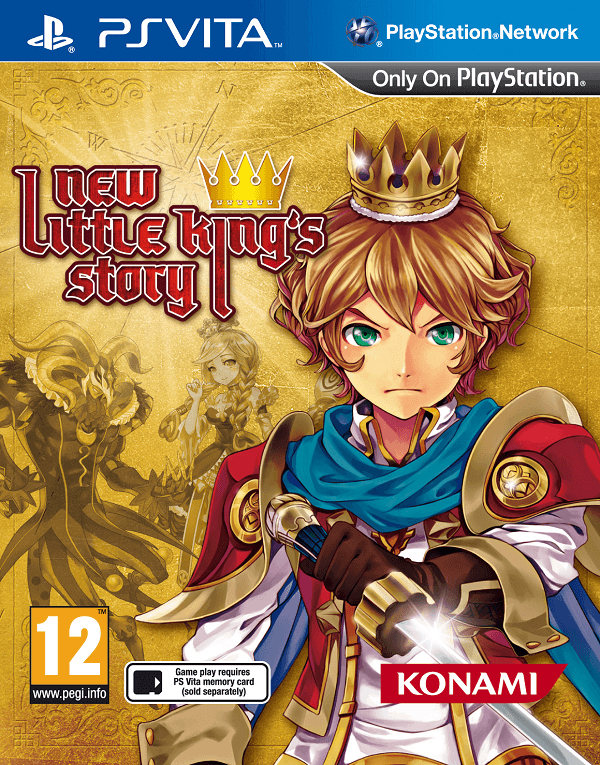 Now that Konami has brought New Little King’s Story to the Vita, is it worth your time? It appears that a number of years have passed since the original Little King’s Story and King Corobo (name can be changed) has built a rather bustling kingdom for himself and is popular not only with his citizens but the princesses as well who are all attending a party he is holding in the castle. Unfortunately nothing good lasts for long for the poor King as monsters suddenly invade the kingdom and strange forces whisk the princesses away and take over the castle. 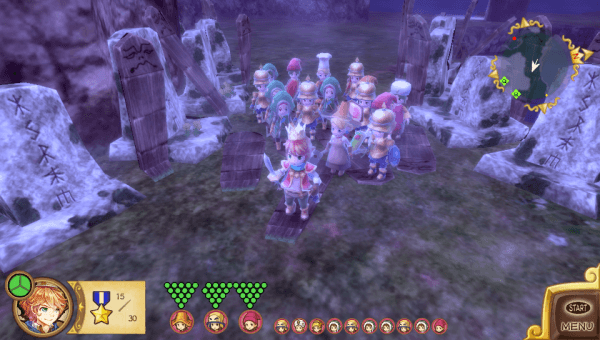 The King manages to escape with his most trusted group of advisers, who happen to be characters from the past game, and a small number of villagers, though he does so at the cost of his best royal guard. Now that he has managed to escape to the outskirts of the kingdom, the King must work hard to restore the kingdom to its former glory by not only rescuing the kidnapped princesses but also ridding the land of the evil within his kingdom. Now New Little King’s Story may contain a few callbacks to the previous game, but these are so minimalistic that anyone who may have missed out on the first title will not be missing a thing. The story itself is delivered nicely and gamers will feel like they are actually making progress with their kingdom as they defeat monsters, gather loot and save the princesses. That being said, the game does have some rather atrocious translation issues practically inexcusable in today’s age. It also helps that if the player takes some time and speaks with a few members of their staff and the princesses themselves, they will find that each character has a little personality to them. All of these things help transform a rather simplistic plot into one that will have the player caring about what happens to their kingdom and eager to restore the King to his throne. One thing that is immediately noticeable is the fact that New Little King’s Story has received an aesthetic upgrade as far as character portraits are concerned. Every time the player talks to one of the main members of the cast, whether for story-driven dialogue or simple small talk, some beautifully drawn anime-like character portraits are shown and each character has various portraits depending on their emotions. This is a nice touch and adds some more class to the game, plus the player also is treated to some nice full-screen images such as the one below. 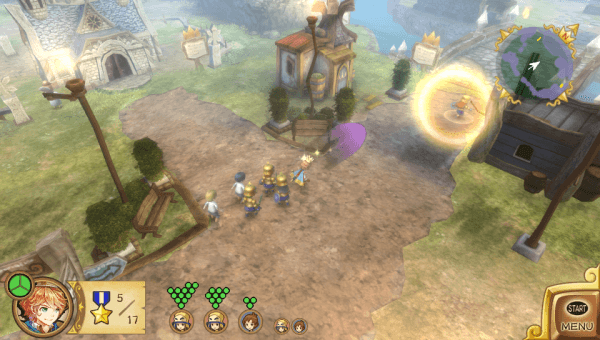 As for the gameplay, the world of New Little King’s Story as a charming feel to it and is both colorful and varied with a number of strange enemies to defeat and even stranger bosses to face off against. Unfortunately the game struggles with one of the key gameplay aspects of New Little King’s Story… large numbers. Once you start having fifteen or more soldiers following you around everywhere you go, the game begins to slow down terribly at times. This becomes even worse when you enter combat with a monster or two with this large force or navigate through a fully built section of your kingdom. Considering the characters are designed with a chibi, though varied, appearance, there shouldn’t be as much slowdown in a game running on the Vita at this point. The background music present in New Little King’s Story is well varied and a joy to listen to as you make your way through the world. Unfortunately the voice acting in the game does leave something to be desired, with most of the actors barely providing serviceable voice work. It is worth noting that the entire game is not voiced however, only certain cutscenes are fully voiced while your soldiers, the princesses and advisors will say a small phrase or two when you talk to them or use them in battle. As the King of the kingdom, the player must split his time between two things; exploration and taking care of the kingdom. Through taking care of the kingdom, the player uses “loot” they gathered through exploration to earn money which allows them to upgrade their King’s abilities such as allowing for more followers, as well as build new structures in the Kingdom. These pre-set and pre-placed structures can be anything from housing to provide more residents, to training centers that will allow you to give your citizens proper jobs such as a soldier, carpenter, farmer and more, allowing them to be more useful in the field by removing obstacles in your path or fighting better. Players will be spending most of their time out in the field exploring however as there is much to do in New Little King’s Story and nearly all of it involves killing enemies and reclaiming your land. 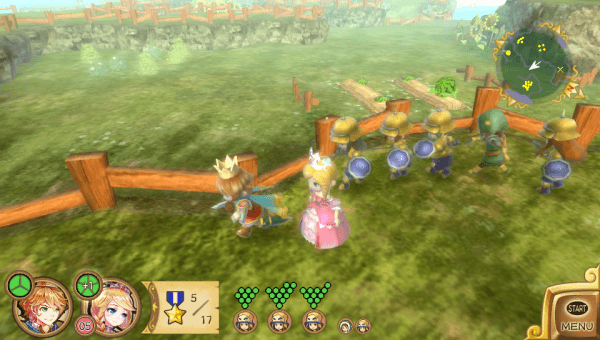 Players do not venture out alone however, as the King himself is rather weak and needs to have the protection of his recruited “royal guard.” You are able to walk up to any villager in their kingdom and have them join your small army. This can be done through simply tapping a villager with the touch screen as well, which is useful for saving time and recruiting the right villagers. Fighting monsters in New Little King’s Story is a rather simplistic affair, but ultimately a satisfying one. Players can order a large number of troops to charge into an enemy and start attacking them however their class would attack such an enemy. This can also be performed using the Vita’s touch screen interface, allowing for easier troop deployment to a large group of foes. Now it is worth noting that although the player can eventually have a rather large army following them around, players often have to balance combat-effective classes with building classes. This is alleviated somewhat by equipping various members of your royal guard with stat boosting items that raise their attack or health. This is especially useful against enemies that can’t simply be beaten by throwing massive amounts of bodies at them. While some earlier bosses in the game are simple to defeat, later bosses require some strategy to win and may need to be fought more than once to beat. While New Little King’s Story does have some slowdown problems and translation issues which can be quite appalling at times, it makes up for it with plenty of charm and enjoyable gameplay. The new character aesthetic and touch screen controls make New Little King’s Story superior to its predecessor in almost every way and definitely worth the large amount of time (25+ hours) you will be able to sink into the game without blinking an eye. New Little King’s Story offers an addictive experience that will have you playing your Vita with renewed faith once more.